The customer supplied us with a pdf with audio which we converted to a fixed layout epub from the supplied files. It was a new challenge for us in that it had many audio files which Kobo don’t support, so a separate epub was provided for Kobo without embedded audio. Google Play only supports certain types of audio files and, although this fit into the category Google Play specified, As the file was optimised initially for iBooks, however, it works well on the iPad with all audio files working correctly. 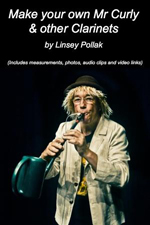 This book will show you how to make your own clarinets, including the You Tube sensation “Mr Curly”. The instruments in this book are all members of the clarinet family. This means that they have a cylindrical bore and a single reed. The instruments are easy to make and the materials (polypipe, bamboo, aluminium) are easily available. There are photos of each instrument, measurements, audio examples and You Tube links.